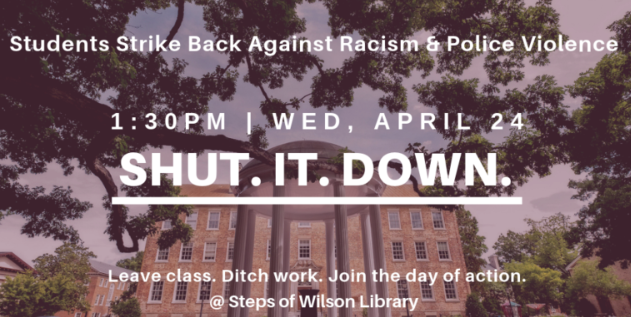 Students at UNC-Chapel Hill are organizing a walk-out protest and “day of action” next week, targeting racism and police violence on campus. The walk-out, planned for April 24, comes after months of student frustration. They say white supermacist and neo-Confederate demonstrators on campus being treated with deference while the school and its police force aggressively pursue students and faculty protesting everything from the Silent Sam Confederate monument to restrictive university speech policies. By offering police protection and free parking to racists while beating and arresting anti-racist students, UNC has made itself complicit in white supremacy. In September, we rallied against racism and police brutality. The administration locked the doors to South Building and refused to hear our demands. Since that time, UNC Police have: 1) protected a violent racist who called for“lone wolf” attacks against UNC, 2) lied under oath to get an anti-racist undergraduate sentenced to jail time, 3) fabricated charges against an anti-racist graduate student, and 4) allowed armed white supremacists to wander campus for a full hour before shaking their hands and letting them leave without consequence. The editorial boards of both the Daily Tar Heel and the Carolina Political Review have condemned UNC’s complicity with white supremacy. The student movement has published a list of demands, most having to do with the disparate treatment of student protesters and white supremacist protesters on campus and police tactics on campus. Opponents of so-called “conversation therapy” are celebrating this week as the U.S. Supreme Court declined to hear a challenge to New Jersey’s ban on the practice. In 2013 New Jersey became the second state to ban the practice, which seeks to “cure” people of being lesbian, gay, bisexual and transgender, from use on minors. Sixteen states — plus Washington, D.C. and Puerto Rico — now ban the practice for those under 18. “In rejecting this case today, the Supreme Court recognized what every sensible and compassionate person across New Jersey and this country knows: anti-LGBTQ conversion therapy is dangerous, discredited malpractice. It is nothing short of child abuse, and there is no legal argument to defend this horrible practice,” said Christian Fuscarino, executive director of LGBTQ advocacy group Garden State Equality, in a statement Tuesday. Though recent polling shows overwhelming bi-partisan support for such a ban in North Carolina, a recently filed bill isn’t getting much traction with the GOP majority in the North Carolina General Assembly. Bans on the therapy seem to have momentum in the country right now. Discussion of its harmful effects — once relatively taboo — has gone mainstream. 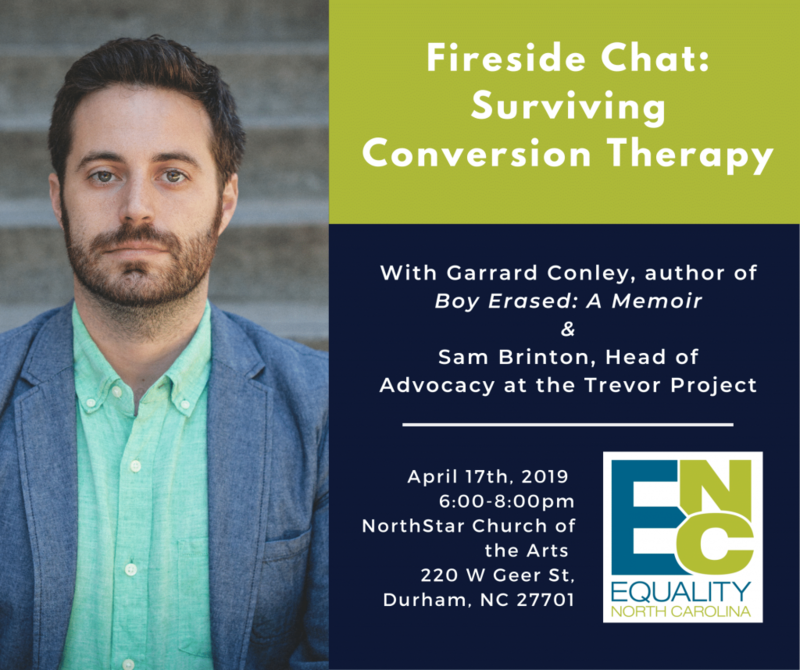 On Wednesday night LGBTQ advocacy group Equality NC is putting on a conversation with Garrard Conley, author of the best-selling “Boy Erased: A Memoir of Identity, Faith and Family” and Sam Brinton, Head of Advocacy for the Trevor Project.